The F350C is an engineering achievement. 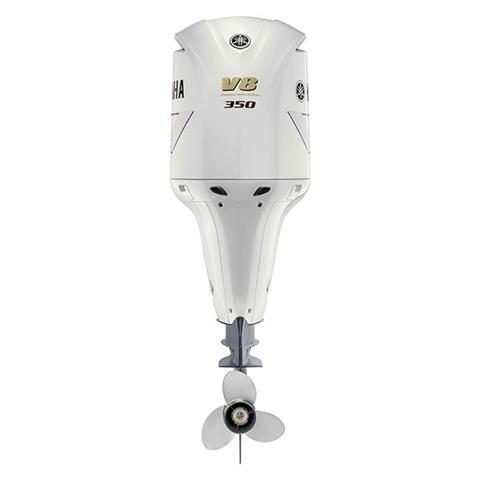 Its impressive displacement and advanced valve train increase power and throttle response, easily producing 350 hp and generating substantially more torque between 2000 ~ 3500 RPMs. It’s all about torque when you have a large offshore boat. It’s the power to get you on a plane, and owners will tell you there’s nothing that does that like Yamaha’s 5.3L V8 F350C outboard. WATER INTRUSION RESISTANCE: F350C has a Tri-Seal latch system to ensure a better fit and seal between the cowling and the lower pan. This means increased resistance to water intrusion for even greater levels of reliability. COMPLETE CONTROL: The F350C is compatible with new Helm Master® with Set Point™. This fully integrated digital boat control system features a new suite of Set Point™ modes, including Fish Point™, Drift Point™ and Stay Point™. 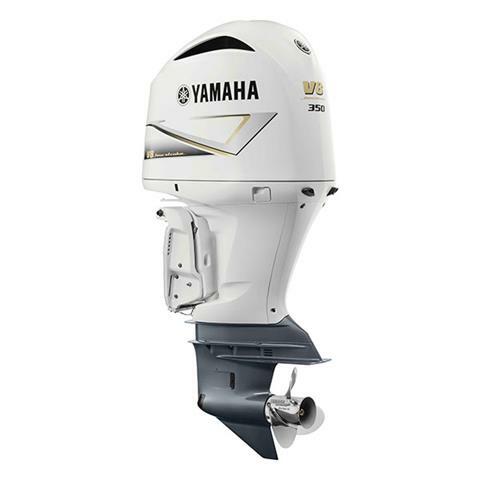 These modes offer superior boat control for fishing, controlled drifting and maintaining position while waiting at a fuel dock. The F350C is also compatible with our Command Link Plus® and Command Link® control platforms. SIMPLE & COMPACT: Advanced engineering features spark plug caps with the ignition coils build right in. It results in increased performance and reliability in a much simpler and more compact design. EFFICIENT COMBUSTION: Individual sensors constantly monitor the condition of the combustion in each cylinder for incomplete combustion. Should this occur, they immediately signal the Engine Control Module (ECM) to adjust spark timing to correct it. PRECISION TROLLING: With Variable Trolling RPM Control, Command Link® gauges allow you to adjust the engine’s trolling speed from 600 ~ 1000 rpm, in 50-rpm increments with the press of a button. This provides consistent trolling speeds in a wide array of conditions. COSTS LESS AT THE PUMP: Unlike other outboards in its class, the F350C runs on economical 89 octane. This cuts down on the operating costs, without diminishing power. 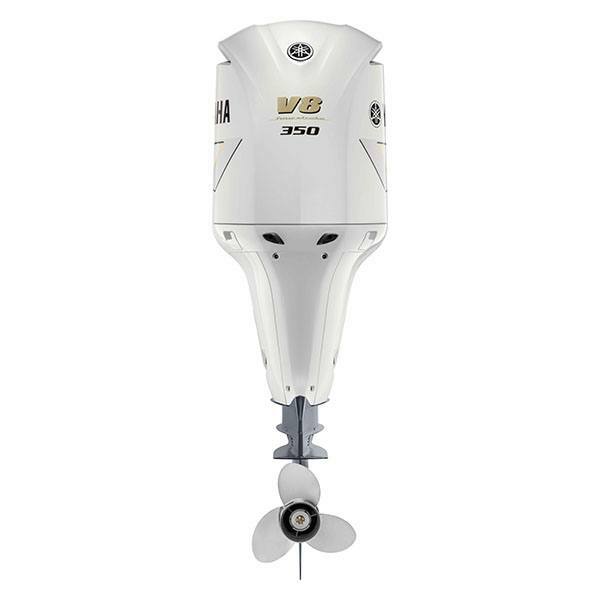 BIG POWER: The 5.3-liter V8 configuration is designed to easily produce 350 prop shaft horsepower, with less stress and strain on internal engine components than small displacement, high-output outboards. Four oversized valves per cylinder increase breathing efficiency and contribute significantly to the F350C’s power and torque. MORE TORQUE: Variable camshaft timing and individual, long intake air tracks provide the engine substantially greater torque between 2000 and 3500 RPM. This planes large offshore boats with authority. OPTIMUM PERFORMANCE: Seven different sensors constantly measure vital atmospheric conditions and engine functions to give the Engine Control Module (ECM) the information needed to precisely and instantly adjust the fuel/air mixture for optimum performance and economy. 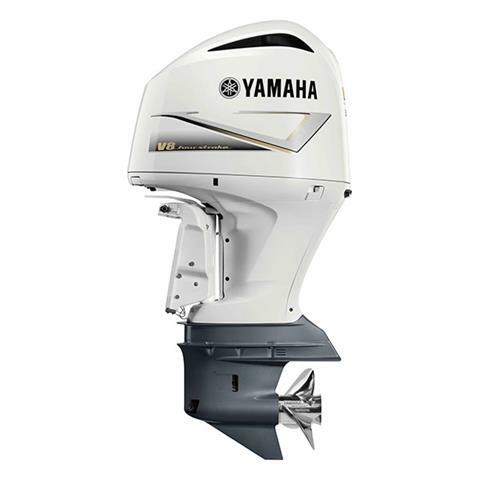 COMPACT DESIGN, EFFICIENT EXHAUST: Precision Multi-Point Electronic Fuel Injection works in concert with long tube intake tracks and Yamaha’s exclusive Dual In-Bank™ Exhaust System for maximum efficiency and compact design. Dual In-Bank™ Exhaust means it exits through the center of the engine between the “V” of the cylinders, rather than on the exterior sides, to allow for a more compact shape. The dual exhaust helps the F350C more easily purge the exhaust for greater combustion efficiency and power. POWER AND EFFICIENCY: Air enters each cylinder through individual long intake tracks, which are ‘pulse tuned’ to provide air at the precise volume and timing for maximum density and power. The result is low-end and mid-range power and torque. ENHANCED COWLING DRAIN SYSTEM: This drains away water that enters the cowling during normal operation by routing incoming air through a labyrinth of passages. This traps and drains water before it enters the engine’s intake. BETTER COOLING: Dual forward and side-mounted water inlets help keep the F350C cooler in a variety of applications and conditions. Dimpled cylinder sleeves also decrease oil consumption and increase cooling surface areas. BUILT TOUGH: Streamlined design incorporates hardened gears and high-strength, oversized bearings and bearing surfaces to handle the tremendous power of the F350C. It also features eight forged pistons that are formed under pressure for maximum strength, anodized for corrosion protection and coated with a layer of solid lubricant for added reliability. ULTIMATE CORROSION RESISTANCE: The F350C is protected by Yamaha’s Ultimate Corrosion Protection System. This includes proprietary alloys, our ACP-221 5-layer paint process and sacrificial anodes placed in and around the power head, mid-section and lower unit to draw corrosion away from vital engine components. A freshwater flush device also helps wash out corrosives, post run.